Hello, everyone. 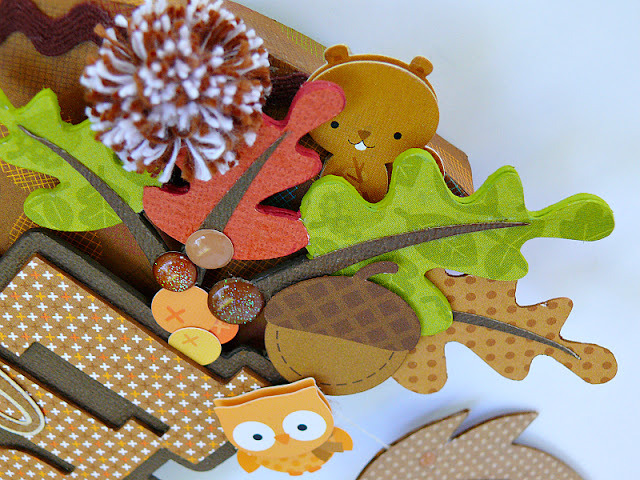 Jennifer here, with my take on the Doodlebug Smash-Up Challenge. The color I chose to work with was Bon Bon Brown and my inspiration was this beautiful altered embroidery hoop by Tamera Tripodi. 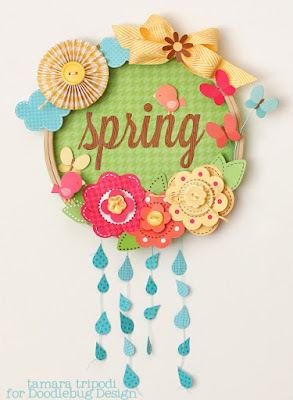 I loved the round shape of the piece, the small bird's and butterflies, the dangling raindrops and the large Spring title. 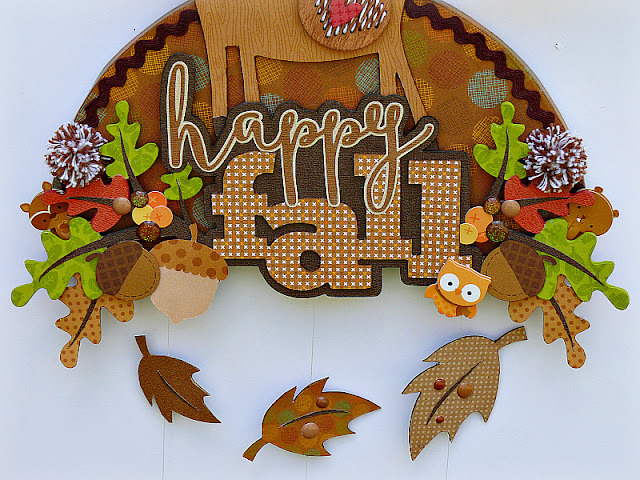 Since Fall's not too far away, I decided to make a wall hanging for the season, using the elements I just mentioned as my starting point. Here's what I created. I did not have an embroidery hoop, so instead I cut a half circle out of chipboard and added a half inch rim around the edge to give the piece a thicker looking edge. Once the half circle was covered with paper, I found some old DB rick rack to embellish the edge. I knew I had been hoarding that for something!! 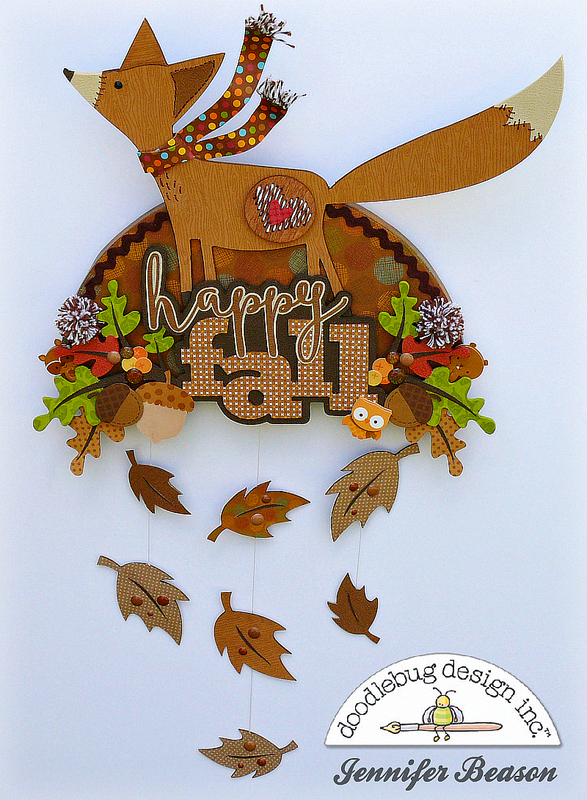 All the elements, like the title, fox and leaves were cut out of chipboard using the Silhouette, then covered with patterned paper or cardstock. 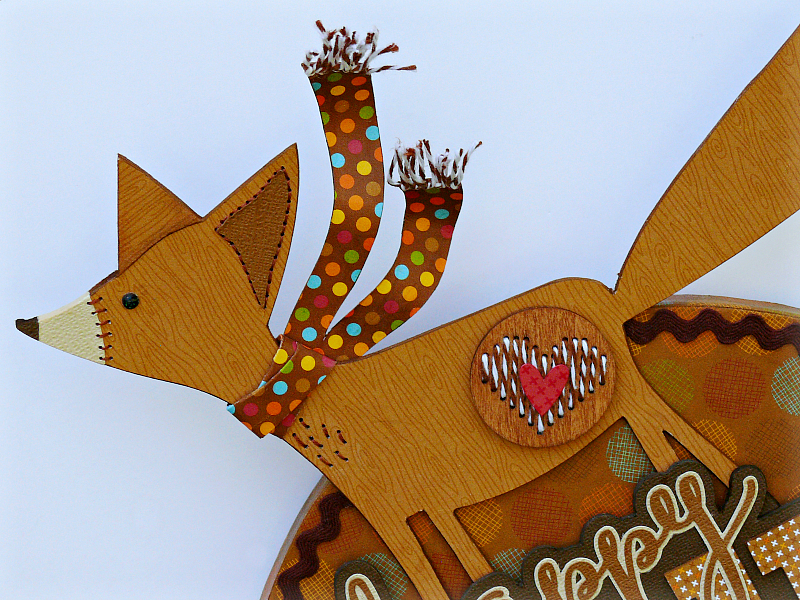 The fox needed something to bring him to life, so some stitching was added his face, ear, chest, and tail. 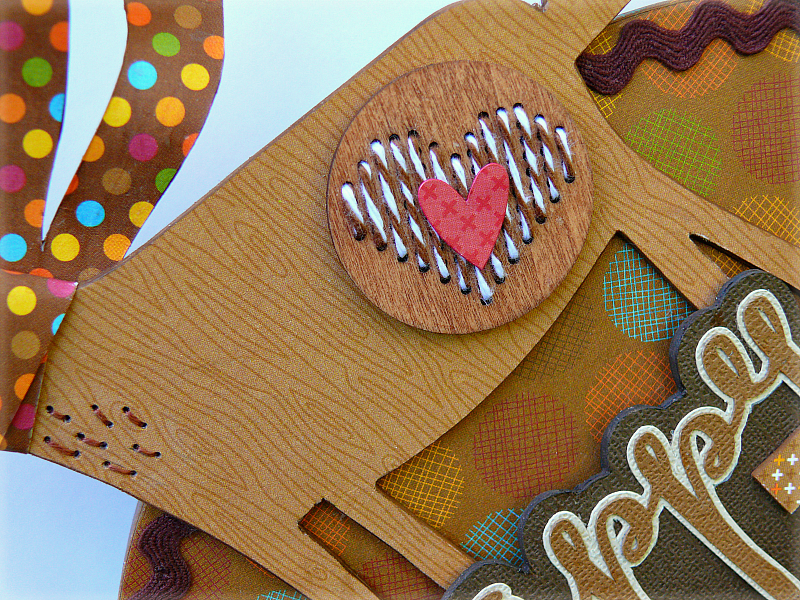 Then to give him a little color, a scarf was made out of patterned paper and twine. More twine was stitched onto a wood embellishment and applied to his body. To finish him off a tiny black sprinkle was used for his eye. 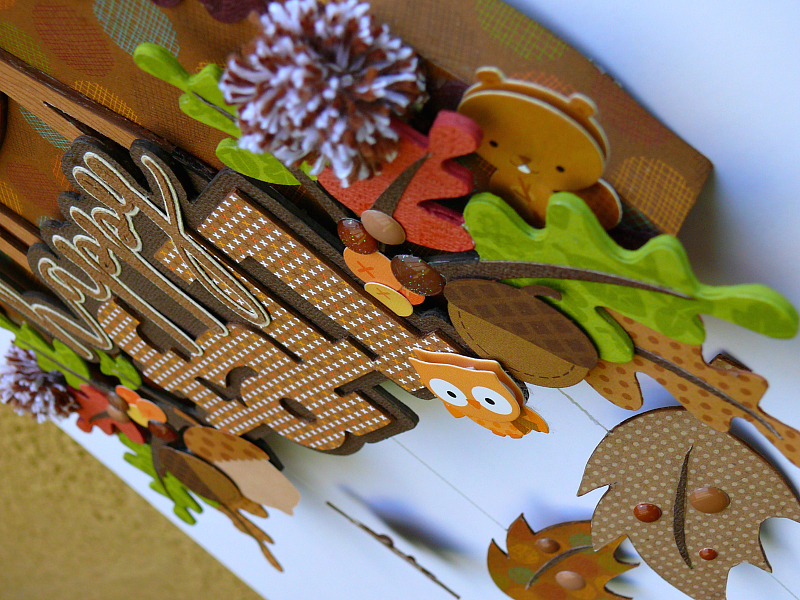 The title was embellished with sprinkles, acorn die-cuts, berry stickers and animal doodle-pops. 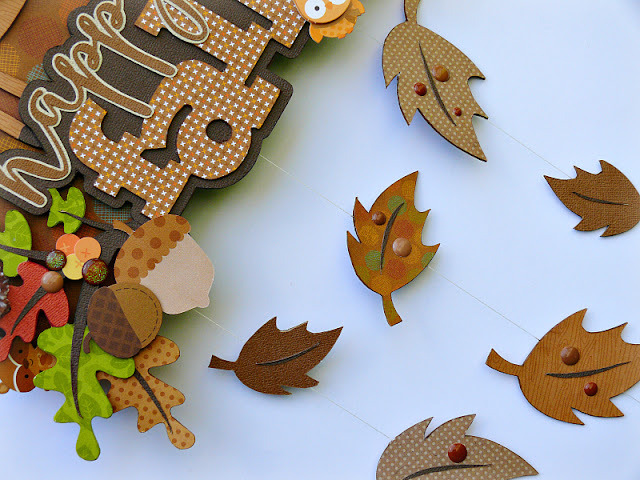 Some small twine pom poms were also added to each side of the title, among the leaves. Instead of raindrops, I made falling leaves on my piece. Each leaf was covered with a different brown patterned paper and sprinkles. Before I go, here are a couple more photos of my project. This is just beautiful Jennifer!!! AMAZING!!!!! So creative and wonderful! You have an incredible eye for details! I'm so impressed! LOVE this! Wow Jennifer! This is stunning!!! You're so clever! I really adore this! How amazing and inspiring!!! I'm in love!! !